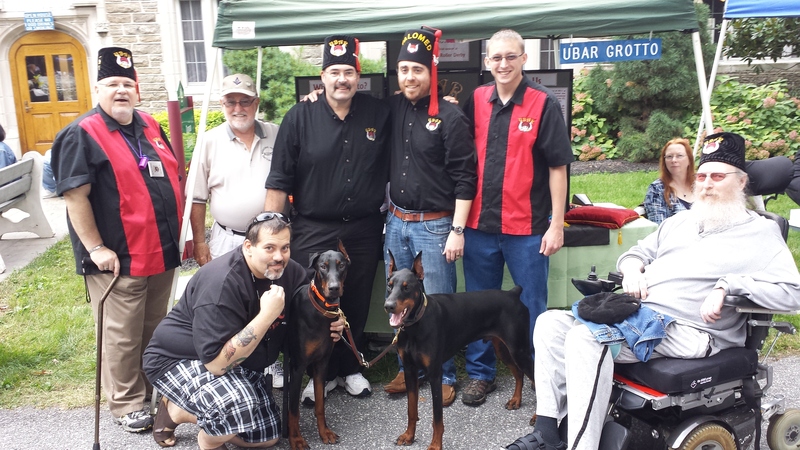 Those were the final words said at the Ubar Grotto booth as Autumn Day 2013 wrapped up at the Masonic Village in Elizabethtown. Held on September 21, 2013, Autumn Day is an annual event sponsored by the Grand Lodge of Pennsylvania. 2013 marks Ubar’s third year participating and our reputation for fraternal hi jinks and fun continues to grow. The first year, Ubar made a big splash by handing out rubber bracelets that said “Real Men Wear Fezzes.” Year two marked the appearance of some of the girls from Harrisburg Area Roller Derby. This year, not to be outdone, Ubarians undertook another great promotional stunt – an impromtu kazoo concert! Ubar Grotto was approached by the Events Department a the Masonic Village and asked to organize a kazoo concert, to be held on the Village Green, and to include the young people from the Masonic Homes for Children. The Prophets then took it one step further, distributing more than 400 kazoos, noise makers, and other instruments, all to engage and entertain the crowd. From tambourines, to slide whistles, to Pro. Harry Smith and his ever ready triangle, Ubarians were in a musical mood! In between concerts, Prophets talked to members of the community and the fraternity as they enjoyed the day. The Grotto netted two petitions from the event when all was said and done! In total, more than a dozen Prophets assisted at the booth throughout the day and we thank them for their service. Autumn Day 2013 – the loudest one yet!